On Oct 25th, 2014 the AGATSU TORONTO REGIONAL KETTLEBELL SPORT COMPETITION will be held in Toronto Ontario! 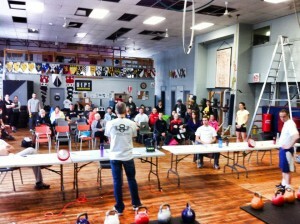 Ranking will be awarded under rules followed by the Canadian Kettlebell Sport Federation. Ranks will only be awarded for traditional weights and events however this year we have added some fun new events designed to challenge and inspire new and seasoned lifters. Traditional Events (10 min) ranks will be awarded for these. Competitors may compete in up to two events. Please note that all competitors are expected to know and fully understand the rules of the competition. A competitor who fails to perform any lift without meeting the necessary performance guidelines outlined under the rules may receive a “no-count.” It is the responsibility of every competitor and coach to properly prepare to perform according to the competition rules. Weight ins for the comp will be held the day of the competition.